I just got back from seeing Tovah Feldshuh’s amazing one-woman show “Golda’s Balcony” about the life of Golda Meir. What a tour-de-force for Tovah, she was absolutely transformed. I just read that she’s performed this play now well over 500 times and has never missed a single performance, and since she never leaves the stage for a second, that’s a pretty incredible feat. The play is the longest-running one-woman show in Broadway history, and I’m grateful that it came to L.A. and that our friend Michelle (my “date” as Kendall put it in her comments on yesterday’s post) was able to get free tickets! Since I now can't help referring to my earlier blog entries, do you remember Feldshuh’s big break in the mini-series “Holocaust,” playing Helena Slomova, the virtuous Czech freedom fighter who married Joseph Bottoms in their forest hideout? She was so good and pure that you knew from the second she appeared on screen that she would never make it to the last reel. Tovah also played Katharine Hepburn in the 1977 TV-movie “The Amazing Howard Hughes” with Tommy Lee Jones as Hughes. Very different from Cate Blanchett’s current turn in the role but an interesting choice! Speaking of icons from the 70s and 80s, celebrity sightings at the after-party tonight included John Savage (so brilliant in "The Deer Hunter”) and Mare Winningham (who recently converted to Judaism and is quite observant even though her husband and children are not Jewish). We also saw Monty Hall of “Let’s Make a Deal” fame and I’m sure there were others but I was too busy making sure Michelle didn’t get carried away with the free-flowing Cosmopolitans (couldn’t they have had drinks that were more appropriate for the event—maybe shots of Sabra liqueur or Milwaukee beer?). Say what you want about Golda Meir, it’s a miracle that this woman, who was born in Kiev in 1898, emigrated to Milwaukee in 1906, and then moved to Palestine in 1921 was able to rise to power and become one of the most formidable women in Middle East history. She was one tough cookie. As David Ben-Gurion once said, “Golda Meir is the only man in my cabinet!” Golda was one of the 25 people who signed the Declaration of the Establishment of the State of Israel on May 14, 1948. Less than 24 hours later, Egypt, Syria, Lebanon, Jordan, and Iraq declared war on the new state. Meir was issued the first Israeli passport and was sent to the United States to raise money for the struggling country. I went to Israel twice during Golda’s reign, once right before the defining moment of the 1973 Yom Kippur War, and once after. My parents were still dragging through their messy divorce so my grandparents decided to take us out of school and hightail it to the Holy Land. (You know your family life is falling apart if you have to go to the Middle East to find peace!) We rented a van and wandered all over the country from Haifa to Eilat. What a beautiful, passionate place, and how different it seemed during that first trip. We went to several Palestinian cities on the West Bank and had no problems at all. I remember visiting the Church of the Nativity in Bethlehem with the bright gold star on the spot where Jesus was supposedly born, and the Tomb of the Patriarchs in Hebron where Abraham, Isaac, Jacob, Sarah, Rebecca, and Leah are buried. Today I think it’s quite difficult for tourists to visit these troubled spots. To show what a different time it was and how naïve we were, I remember that our Arab driver had a cousin who lived in the Midwest. He asked us to deliver some wrapped packages to him and we agreed, never once looking inside the boxes or telling the El Al security officers that a stranger gave us the packages. Tovah Feldshuh’s emotional performance is still ringing in my ears and I know it will stay with me for a long time. 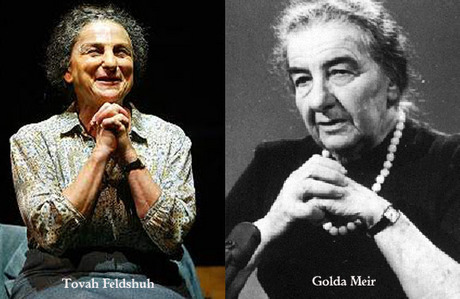 I also remember the least likeliest of Golda Meirs. Who would have ever thought that Swedish beauty Ingrid Bergman could convincingly play the role of the dumpy Jewish leader, but in her last role before her death, that’s exactly what Bergman did! Though she did wear prosthetics to look more like Golda, Ingrid’s gorgeous features had aged into a more earthy look that worked well for the part. In some ways, those two strong women were very similar, I'm sure they would have enjoyed each other. Well, Danny, this posting has moved me more than I can say - so it's better to write it. It awakens in me all my deepest, most fond memories of being in Habonim in Bulawayo, emigrating to Israel in 1969 and my love for that ancient, troubled land. When Anwar Sadat came to Israel, Gilad and I were sitting upright, with bated breath, on our little couch in our tiny living room in Ramat Hasharon, watching the television. I cried so much as Sadat walked down the row of Israeli cabinet ministers that I thought I would have to be taken to the hospital! When Sadat stopped by Golda Meir my weeping became loud sobbing. What a moment. I will never forget it. It gave me so much hope. Later I would feel that kind of hope again when Mandela was released. That's why I KNOW we can all make peace if we just wanted to. And who could ever forget Golda's classic line to Sadat, that only she could get away with: "What took you so long!" Fantastic post, but I have to ask: Your parents wouldn't let you go to New York to see the fair, but they let you go off to Israel while Syria and Egypt are building up for an attack? It shows what they must think of New Yorkers! Danny, I just saw this same show (but starring Valerie Harper) a few weeks ago. I happened to notice the title of the entry on your sidebar when I was reading your most recent post about Vegas. I knew almost nothing about Israel, let alone Golda, and I found the whole thing fascinating. Yes, let's hear more from the bloodthirsty Ms. Golda Mabovitz . . .
"This country exists as the fulfillment of a promise made by God Himself. It would be ridiculous to ask it to account for its legitimacy."
. . . One has to ask, why are you people so blind and full of hate?